After a complete makeover, Viva Hollywood is adding a bit of spice to Hollywood Boulevard. 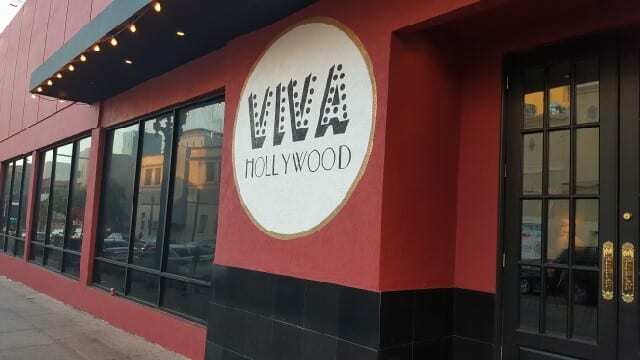 Located in the original Beso space, Viva Hollywood is large and open. It is bright with white walls and high ceilings. The bar and a lounge area are in the front half of the restaurant and flow through to the dining room. There is a stage at the far end of the restaurant for the nightly live music. Upstairs overlooking the dining room is additional seating as well as a private event area know as the “piñata room.” From the dining room floor, you can look up into the private room that is filled with brightly colored piñatas. 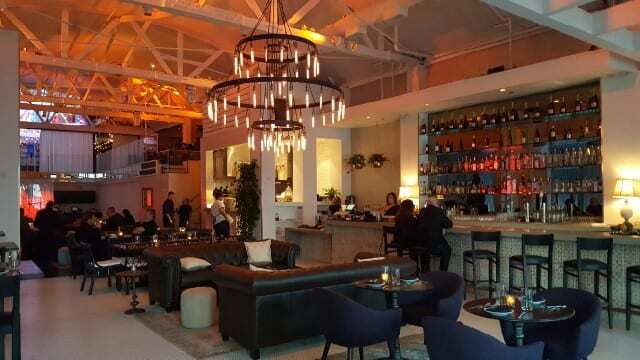 Chef Raymond Alvarez, who has worked under Mary Sue Milliken and Susan Feniger, as well as at Pink Taco on Sunset Boulevard and Toca Madera and Tocaya, is at the helm. He has brought these experiences together for the Mexican cuisine at Viva Hollywood. From ceviche to tacos to flatbreads and mole, there is something for everyone on the menu. 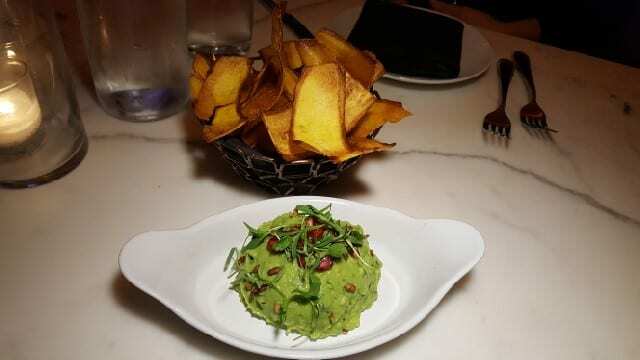 Viva Guacamole (California avocados, jalapeno, cilantro, red onion, toasted sunflower seeds) is smooth and creamy and lightly seasoned and served with plantain chips that are lighter than typical corn chips. 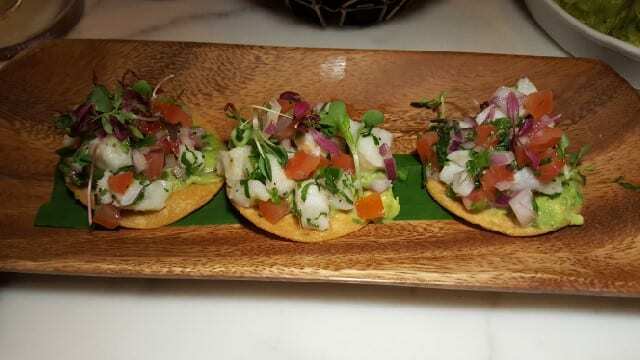 Ceviche Blanco Tostadas (seabass, tomato, jalapeno, cilantro, lime juice, guacamole) are little bites of bright flavors. In concept they are a great idea. The tortilla chip has a thin layer of guacamole and then the ceviche on top. 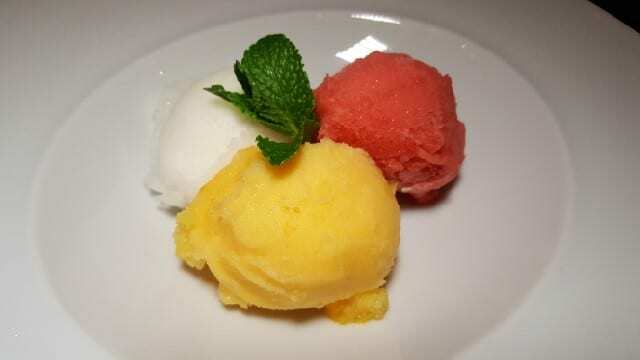 But, they are a difficult to eat as they are more than one bite and will crumble onto the plate after the first bite. 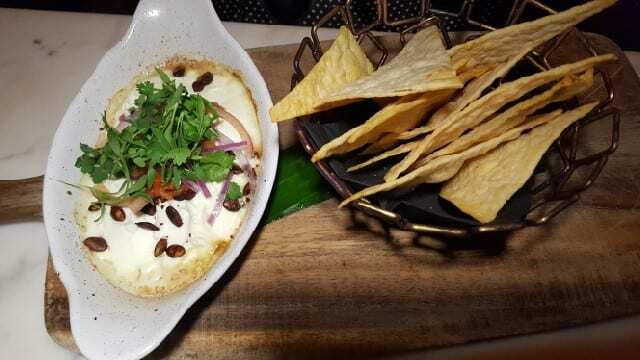 Cabra Fundido (baked goat cheese, tomato, cilantro, toasted pepitas) served with tortilla points is smooth and creamy and quite addictive. 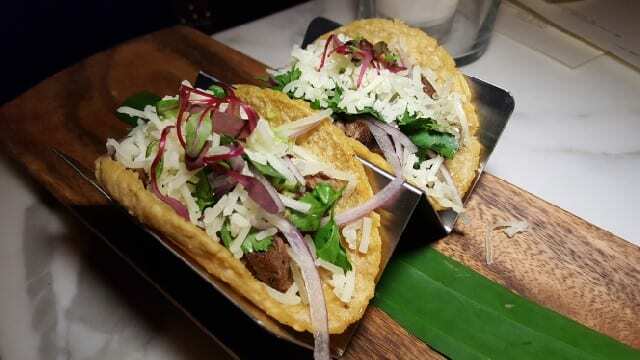 Carne Asada Tacos (chipotle rubbed skirt steak, guacamole, red onion, cilantro, manchego) are served with house-made corn tortillas. 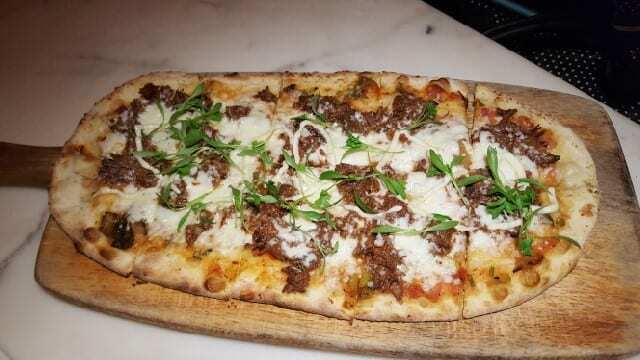 Fresco Flatbread (short rib, gueso fresco, roasted tomato sauce, garlic aioli) comes on a think flaky crust. 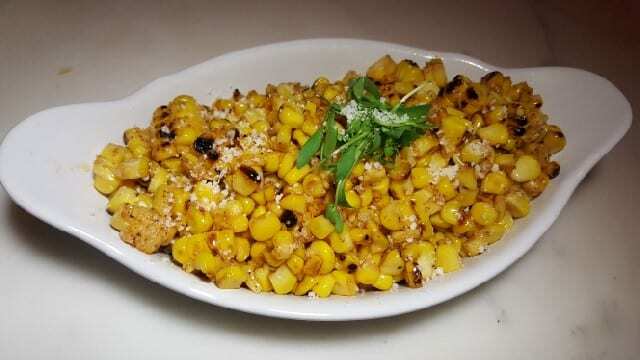 Corn with cotji cheese and chili powder is rich and buttery and delicious. 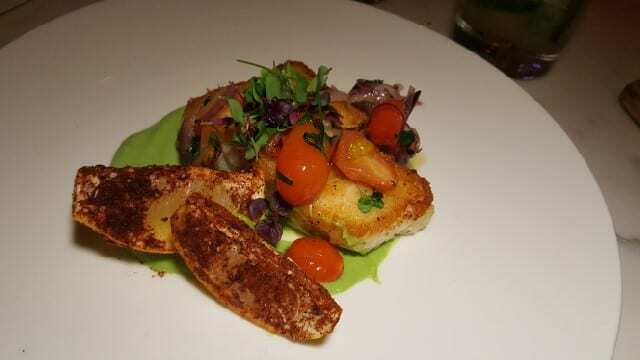 Seared Seabass with avocado puree and marinated pear tomato had a nice sear on the outside but the fish was slightly overcooked and dry. 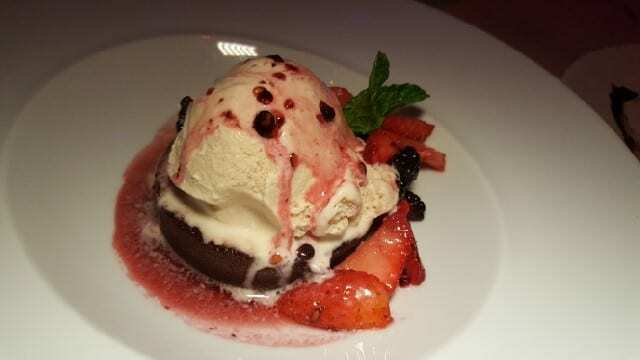 If you have a sweet tooth, do not pass up dessert. 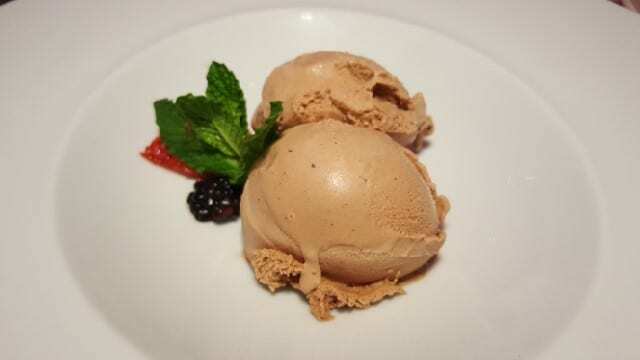 The ice creams and sorbets are made in-house and the Mexican spiced chocolate ice cream with cinnamon was a favorite. 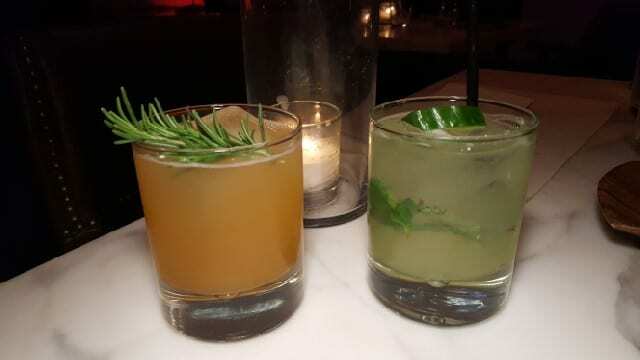 Viva Hollywood has a full bar with cocktails created by beverage director Erik Weatherford. The wine list is succinct and appropriate for the restaurant, featuring wines only from Argentina, Spain and Chile. 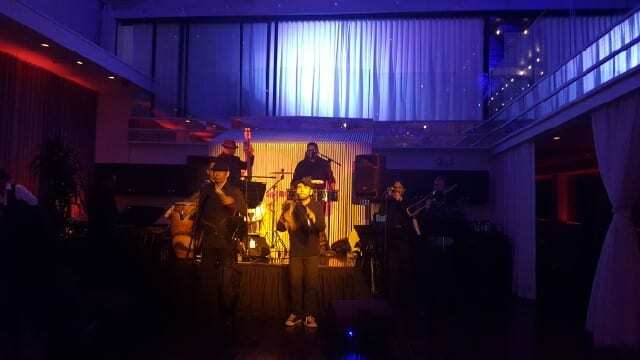 After a filling up on the food and drink, stick around for live music and perhaps a bit of dancing. 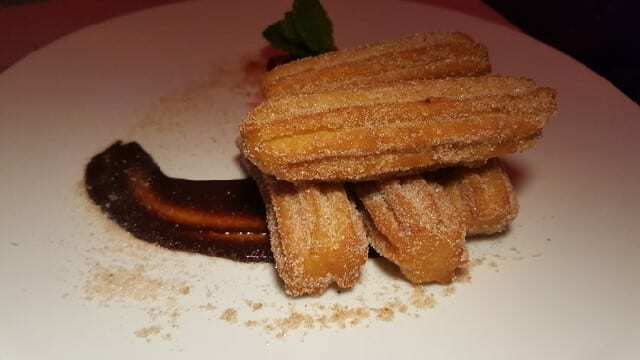 This entry was posted in Food and tagged Chef Raymond Alvarez, food, Hollywood, live music, Mexican Food, Mexican restaurant, Viva Hollywood by Allison Levine. I agree with you. The cocktails were not up to par for the day and age. They were ok but ok is not good enough.